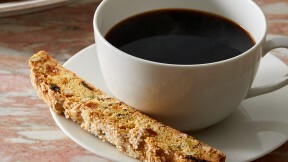 Make Martha Stewart's Tuscan Biscotti (Cantucci) from the Italian Cookies episode of Martha Bakes. Preheat oven to 350 degrees, with racks in upper and lower thirds. In a medium bowl, whisk together flour, baking powder, and salt. In the bowl of an electric mixer fitted with the paddle attachment, beat together eggs and granulated sugar until pale and thick, about 5 minutes. Mix in orange zest and vanilla. Gradually beat in flour mixture until combined. Mix in nuts and dried fruit. Divide dough evenly between two parchment-lined baking sheets, forming each half into a 9-by-5-inch rectangle. Brush tops with egg white and sprinkle each with 1 tablespoon sanding sugar. Bake, rotating sheets halfway through, until golden all over and tops are firm to the touch, 25 to 30 minutes. Transfer sheets to wire racks and let cool 30 minutes. Reduce oven temperature to 300 degrees. Working with one rectangle at a time, transfer dough to a cutting board. Using a serrated knife, cut on a slight diagonal into 1/2-inch-thick slices. Arrange, cut-side down, on fresh parchment-lined baking sheets. Bake, rotating sheets and flipping cookies halfway through, until lightly golden all over, about 40 minutes. Transfer sheets to wire racks and let cool completely. Cookies can be stored in an airtight container at room temperature up to 2 weeks.